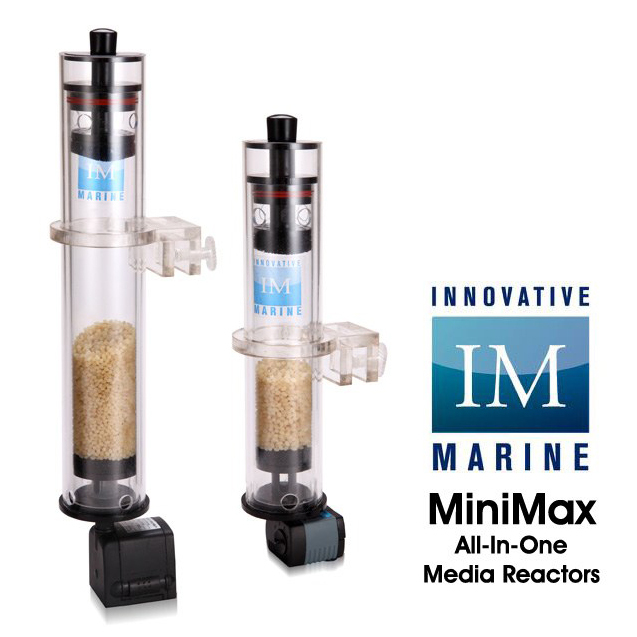 If you desire the highest water quality but are frustrated with some of the media reactors on the market then meet the all new Innovative Marine MiniMax All-In-One Media Reactor. The MiniMax All-In-One Media Reactor is a novel approach to optimize chemical and biological filtration for nano & mini marine aquariums, something that has typically been lacking with an out of the box plug and play type product. The innovative Patent Pending design minimizes the need for flexible tubes, pvc pipes, ball valves, thumb screws, and unnecessary clutter that are usually associated with typical media reactors. The ingenious design maximizes performance and offers out of the box responsive flow control, easy maintenance, low power consumption, and the smallest form factor ever built which is necessary to fit within the Nuvo Series filter compartments. The versatile MiniMax is designed to be discreetly hidden behind All-In-One Aquariums or placed directly in other brands of aquarium sumps. The MiniMax Desktop All-In-One Media Reactor is designed to fit into the Innovative Marine Nuvo Pico 4 and Nuvo Nano 8 aquarium filtration compartment and the MiniMax Mid Size All-In-One is designed for the Nano 16, Micro 30 and Mini 38 Innovative Marine Aquariums but it can also be used in other brands of aquariums and sumps as well. 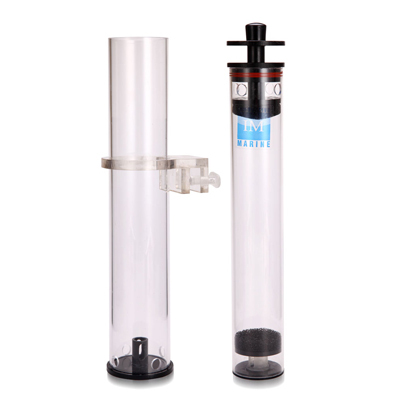 Coupled with the Innovative Marine Skimmate series protein skimmers is going to close the chain link for desktop and mini aquarium filtration. Here’s a short video that will show you how easy this design is to operate and change out media. 3. Eliminate Messy Maintenance– Internal chamber acts as a removable cartridge that simply slides out of outer chamber and automatically drains water out without the need for tools and time consuming thumb screws to unfasten. • Just add one of our favorite media choices from Reef Interest (NP Biopellets, NP Biopellets XL or PO4x4) or you may choose to use carbon media.